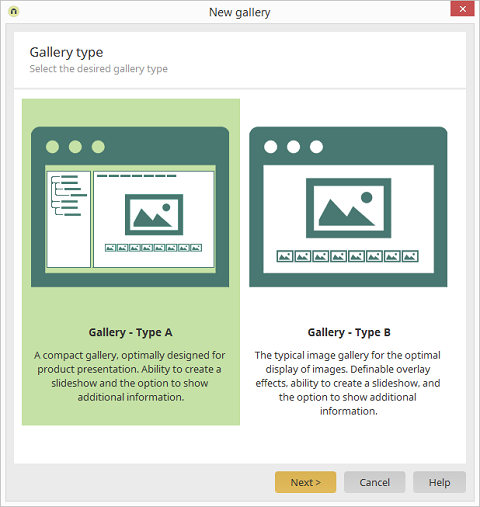 The gallery type A is a compact gallery that is optimally designed for product presentations. The images can be shown in a slideshow. Additional information can be shown by clicking on an image. The gallery type B is the typical image gallery for the optimal display of the images. Here you have the ability to define overlay effects. Here as well, you have the ability to display in a slideshow and to show additional information. Please note that you cannot switch the type after creating a gallery. Instead, create a new gallery and select the desired type for it. A type A gallery must be the only gallery on a page - you may not create a second gallery on this page.